Behavioral geneticists are fond of noting that more than half of the risk for mental illness is heritable, and, fonder of the number of specific risk factors that have been identified. What is much less well known however is how these heritable factors interact with the environment to potentiate risk. Psychiatrists, on the other hand, rightly point out that children and adults who experience traumatic and social stress are also at greater risk for psychiatric illness. Indeed, brain imaging has shown a number of anatomical regions where activity declines in subjects and patients alike who experience trauma or other difficult experience. In their recent paper, “Stress-induced changes in primate prefrontal profiles of gene expression,” Karssen and colleagues take a major step towards bridging the gene-by-experience puzzle and examine how gene expression changes in response to socially stressful experience. 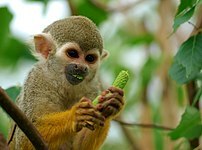 Using a squirrel monkey model, an experimental group of males was subjected to intermittent social separation and also exposure to new roommates – conditions known to elevate cortisol levels. Using a (note the caveat here) human microarray platform and several signal analysis protocols, the investigators present several hundred genes differentially (interestingly mostly down-regulated) expressed in the frontal cortex. So – the question begs – were any of the genes identified in the Karssen study the same, or in the same pathways, as known genetic risk factors ? Yes – well sort of. The authors present several genes, including a few involved in GABA signaling, that had previously been linked via gene expression studies to mood disorders in humans. Certainly, these are attractive candidates for family- and population-based association studies.